Få en smak av den autentiska spanska kulturen under denna 4,5-timmars matlagningskurs i Paella i Valencia, den berömda risrättens födelseort. Handla ingredienser på Central Market tillsammans med din guide och grupp, och gå sedan till köket för att lära dig att göra enkla ingredienser till en utsökt måltid med djupa kulturella rötter. Denna turné omfattar alla instruktioner, ingredienser, mat och drycker under klassen. I've done this class before and had such a blast that I brought some friends this time. Good food and good times along with a little history. We joined this class coming off of a cruise ship. The timing was perfect for our day ashore. Starting with the local marketplace (which is a great way to experience it - buying supplies for the food we'll be making) then a good pace of paella making. Chef Carolina made it all so simple to understand that I'm sure I'll make a wonderful paella at home. Sharing our food together with plenty of wine and laughter made this one of the best experiences we've had. I took my wife and mother in-law to this class. We were a little late and almost missed our departure to the market as the place was a little challenging to find. I suggest giving yourself plenty of time to find it in advance. Other than that, our guide/chefs were absolutely amazing and entertaining. They showed us how to make a traditional Valencia Paella and explained to us the history. We had plenty of time to socialize with the group over tapas and wine as the Paella cooked. I would highly recommend this class for anyone looking for a traditional and entertaining experience in Valencia! The best day out during our holiday, cook school is very professional and well run, we started off by walking to the centro market to pick up ingredients which was a joy of sights and sounds. We then returned to the school and cooked the most wonderful paella under the guidance of our chief and interpreter. To finish the day off we dined on our own creation with the other guests making it a really enjoyable experience, one not to be missed. You really learn how to make Paella very authentic. The teachers/chef were amazing. It was a lot of fun going to the market and getting the ingredients and then making the paella to finish it off with eating our made paella. The make it a wonderful day, you get appetizer, paella salad and dessert with wine. It was amazing and a GREAT time. What a wonderful experience for our entire family! We were looking forward to this class during our three week trip to Spain and it did not disappoint. We visited the school with our two children (ages 7 and 9), and they were able to participate in many ways. We thoroughly enjoyed the visit to the market, the prep, and the wine and food! Chef was amazing. Thank you so much for a fantastic experience. What fun! Great time with other great people. We were late in finding the locale easy to do in Valencia so missed the market part but visited there later. The class is fun, interesting and delicious. The chef spoke Spanish and Maria translated. This includes the class, delicious food, wine and photos emailed to you from the experience. Highly recommended. An abosultely amazing class and having a english translator came in handy for the entire coarse. 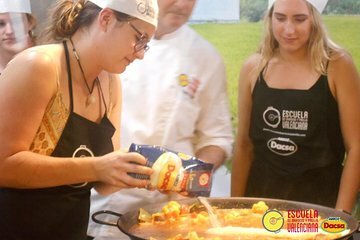 The class was the best way to enjoy an authentic paella and learn the cuture of the area. I would recommend the option with the market shopping to enjoy the history of the area. Loved it! We did not notice we should select the sea food paella 24 hours before, but we could have the vegetarian one. The atmosphere was just great we enjoyed meeting the people round the world. We had very good explanation about the ingredients in the market and for each step of making the paella. Finally we had very good lunch with wine and our own prepared paella. Fun time and made a yummy paella. Very well done and worth every penny.